Hatteland Display will unveil a unique new service to the marine industry at SMM 2008. The leading marine display and computer manufacturer has developed a new high-speed, cost-effective color calibration method that enables the delivery of color calibrated displays and display calibration services to its system integrator customers. In light of the recent announcement of deadlines for the mandatory carriage of ECDIS on certain vessels, this unique to marine display manufacturers service couldn't have come at a better time, as marine systems integrators around the world look to meet the demand for ECDIS solutions as the deadlines approach. The challenge of color calibration that Hatteland Display overcomes is to make sure all 3 x 63 colors defined in an ECDIS are correctly displayed on the surface of the LCD, ensuring that in use, there is no chance of the S57 chart being read incorrectly due to incorrect colors. The new color lab gives Hatteland Display the ability to perform in-house measurements to support both calibration and verification methods, that are required for the Type Approval of displays for ECDIS. The first method is a test of a monitor as part of an integrated system, often referred to as ECDIS 'calibration'. 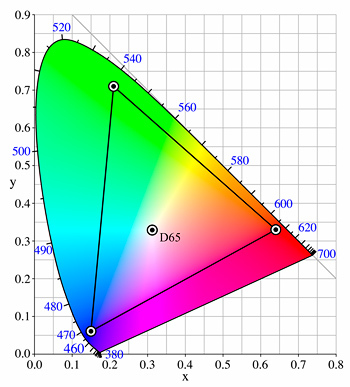 In this test, a unique color correction table is created for each monitor, which is stored in the monitor's flash memory. The ECDIS software must download the table and use it to set the output from the ECDIS computer. 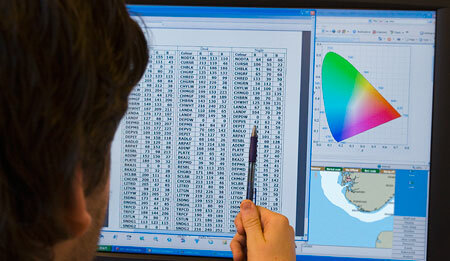 In the ECDIS verification method, the color correction table is created only once for a system. To check that displays with identical type numbers are within the requirements, a verification process is performed by measuring on five colors from the DAY table. "Our new color calibration service can provide final type approved displays that can be integrated directly in an ECDIS, or color calibration services at any stage of our customers' product life-cycle," comments Lars Eriksen, Vice President Sales & Marketing, Hatteland Display. "By offering a range of methods to ensure displays are properly calibrated, we can become an integral part of a system integrators manufacturing process at any stage, ensuring that they can concentrate on development of systems for their customers." In addition to ensuring that ECDIS approval requirements are met, correct color calibration allows new system components to be installed with ease, as once calibration is complete, displays and computers within an ECDIS can be interchangeable, without the need for further approvals. This ensures smooth servicing and maintenance, and long product life as new displays and computers are integrated over what could be decades of use of an ECDIS. Visit www.hatteland-display.com to find out more about ECDIS color calibration and the company's extensive range of marine displays, computers and panel computers. Hatteland Display products can be found throughout SMM including on the Transas stand, Hall B6, Booth 231.